Announcing a new theme template from Pixel Film Studios Picture Plus, which includes over 40 environment shots inside Final Cut Pro X. Picture Plus theme is fun and a perfect theme for this summer. Developers of Final Cut Pro Themes and Plugins have announced the release of the Picture Plus theme from Pixel Film Studios. Picture Plus allows Final Cut Pro X users to display personal pictures and videos within an instant photo world. Users simply have to choose the desired camera animation watch as Picture Plus brings their project to life. Picture Plus comes with over 40 environment shots, one transition, and one lower third. With so many elements, FCPX editors can create a video from beginning to end. Picture Plus allows Final Cut Pro X users to display home videos and pictures within an instant photo collage. Editors can simply choose the camera animation desired and watch Picture Plus bring their project to life. Picture Plus gives users over 40 environment shots with varying degrees of height, lenses, and depth of focus so that no two shots look the same. Editors can quickly and easily piece together a demo video by simply dragging and dropping a series of environment shots into the timeline. 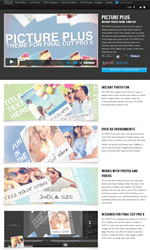 All of Pixel Film Studios' themes work with both photos and video footage. Utilize the easy to use drop zones to attach the media to the theme. Double click the drop zone in the FCPX window to activate on-screen controls that will allows the user to scale and position the media. Alternatively, use the published position and scale parameters to control the scenes. Picture Plus is designed exclusively for Final Cut Pro X. Editors can use the inspector window in FCPX to control the look of the theme. Users can change the text and theme background colors, adjust the text, and utilize the easy to use drop zones to create the project they always wanted. FCPX users can drag, drop, and create.